In 1976, Nyles and Ruby Herman entered into a partnership with Rich Robertson, owning Waukon Feed Ranch. The Hermans saw the mill as fitting into their farming plan. “We had one site and one small office and today the WFR is a huge business,” shares Ruby Herman. In 1977, the Hermans became the sole owners of Waukon Feed Ranch. Today, Waukon Feed Ranch is owned and operated by Brad Herman, Kim Winters, and Brian Herman, children of Nyles and Ruby, who are continuing the family owned business into the 21st century. The business includes: a feed mill grinding feed daily for over 120,000 pigs in northeast Iowa, transportation with over 20 trucks on the road, grain marketing and storage, LP delivery and a gas station, construction crews, onsite repair shop, agronomy department, and managing over 24,000 sows in three states. Waukon Feed Ranch continues to meet the challenges of agriculture, being competitive and providing quality services to farmers. 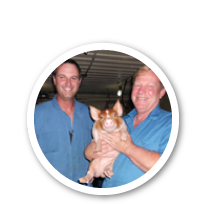 From humble beginnings, Waukon Feed Ranch owners and employees strive every day, promoting agriculture from quality pork to the promotion of using local grain to power equipment and vehicles. We are in our 41st year. Check out how our family owned business has grown and changed over the years by watching the video below!